Here at Heritage we are continuously working to improve our services to our customers. We believe we have a responsibility to demonstrate our commitments to our policies and promises by gaining the recognised industry qualifications so that our customers can be confident that independent auditors have verified that we act responsibly and do what we commit to by operating safely and within recognised quality and environmental management systems. Health & Safety is of paramount importance and to demonstrate our commitment to others health and safety at work we have been certified with ISO 18001. Quality Management Systems have been implemented and we have been independently certified with ISO 9001, which demonstrates to customers our commitment to ensuring that throughout our processes we follow recognised procedures to ensure customers receive a quality product and service. Environmental Management Systems. The environment is important to all of us and we believe that although envelopes are an important paper product we have a responsibility to consider our actions and pro-actively minimise our effect on the environment by reducing what we consume, re-using what we can and recycling all materials where possible. To do this we need to measure and manage our processes and we are proud to demonstrate our commitment adherence to environmental management systems for which we have been certified with ISO 14001. Sustainability forms an ever increasingly important consideration. We recognise that consumers cannot continue to use valuable resources without replacing what is taken. Paper envelopes manufactured by Heritage Envelopes are manufactured from paper sourced from responsible and controlled sources which means that customers can be sure they are supporting the environment by using papers sourced from mills which give more to improve the environment than they take. The most recognised certification throughout the paper industry is FSC® and PEFC. The Carbon Trust Standard is a mark of excellence that has been awarded to Heritage Envelopes. This certification gives recognition for continued carbon reduction based on a rigorous, independent assessment. It certifies that organisations have measured, managed and actively reduced their carbon emissions across their own operations, and we are committed to reducing them year on year. All of the certificates and policy statements are available to view and download in our downloads section. 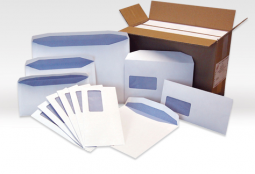 Find out details on the range of envelopes that Heritage can provide.